Did you know that 17 million Americans don’t have a bank account? There are a number of reasons for this, but among them are millennials thinking they don’t need a bank at all. Distrust of financial institutions is high these days, but that doesn’t mean you should go without a checking account. Having one is essential to managing your money on a regular basis! 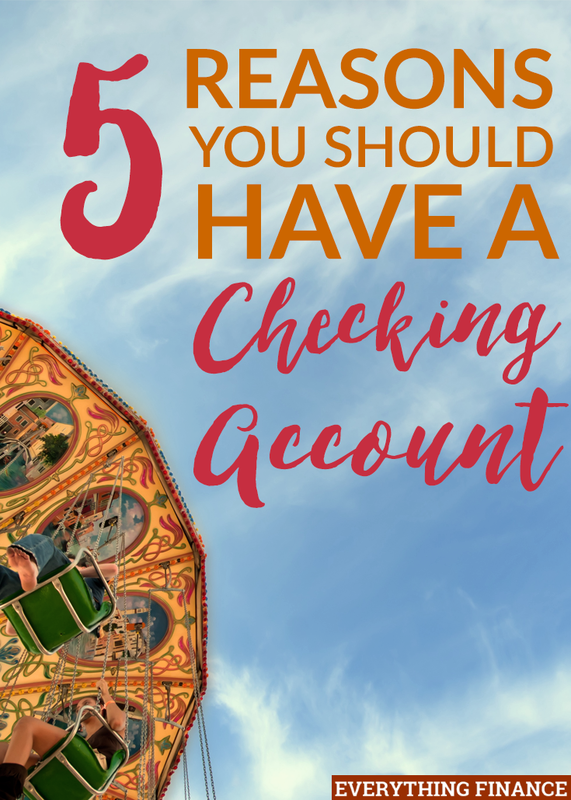 Here are 5 reasons why you should have a checking account. Checks provide a paper trail or written proof that you paid someone. Each time you write a check that ultimately clears your account, there are several records of it. Having this proof is important for tax purposes (when you make tax deductible charitable donations) and whenever you’re paying a person or company by mail. It’s always a good idea to have these handy in case you ever need to double-check your records in the event of fraud or a duplicate charge. This is a tip for older generations (so share it with your parents or grandparents if you can! ), but paying by check is safer than cash when shopping by mail. Cash can be taken and spent by anyone without a trace. The paper trail a check leaves discourages theft. Additionally, if you like to send people cash for special events, such as the holidays, anniversaries, or birthdays, then sending a check is much better than sending cash. As a bonus, checks are also less expensive than money orders or cashier’s checks – another alternative to paying by paper. Most checking accounts come with free bill pay these days. That means you can manage and pay all of your bills online. This is a great option to have if you’re sick of all the paper clutter that’s gathering in your kitchen or on your desk in your office. Cut down on the paper by opting into eStatements, and switch to making payments online instead. Checking accounts also come with debit cards, which allow you to make purchases online and track your spending with ease. When you use cash, you have to manually keep records of where it’s going. With a checking account, you can simply view your recent transactions to see where you’ve been spending. Finally, and most importantly, when you have a checking account, you can set up with direct deposit with your job. You can say goodbye to collecting a check, going to the bank, and cashing or depositing it. Your paycheck is automatically deposited into your account with direct deposit (hence the name). How convenient! Imagine if you decided not to have core banking options, and instead kept all of your cash in an envelope or a bag. Think of how crazy and out of hand that would get! Most people don’t even balance a checkbook anymore. They simply link their financial accounts to software such as Mint.com or Personal Capital, and manage their money from there. However, having a checking account with online access gives you a much easier way to keep track of everything – certainly easier than having your cash laying around. Checking accounts have no Federal limits on the number of electronic transfers you can make each month. Did you know that savings accounts do? That’s right – you’re typically only allowed up to six transactions in a single month. That’s pretty limiting if you think about how often you spend money! Your best bet is opening both a checking and savings account, with transfers going directly from your checking to your savings. This is also one of the best ways to save your money! It sure beats having all your money laying around in a pile somewhere, not earmarked for specific financial goals. Overall, having a bank account is a necessity when it comes to managing your money quickly and easily. The best banks are usually online-only banks, which offer the most convenience, and have the least amount of fees.